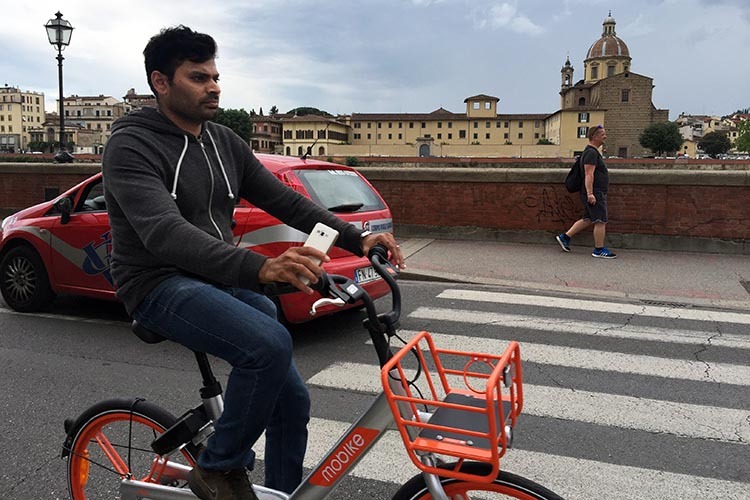 We recently enjoyed a four-hour electric bike tour of Florence, Italy. 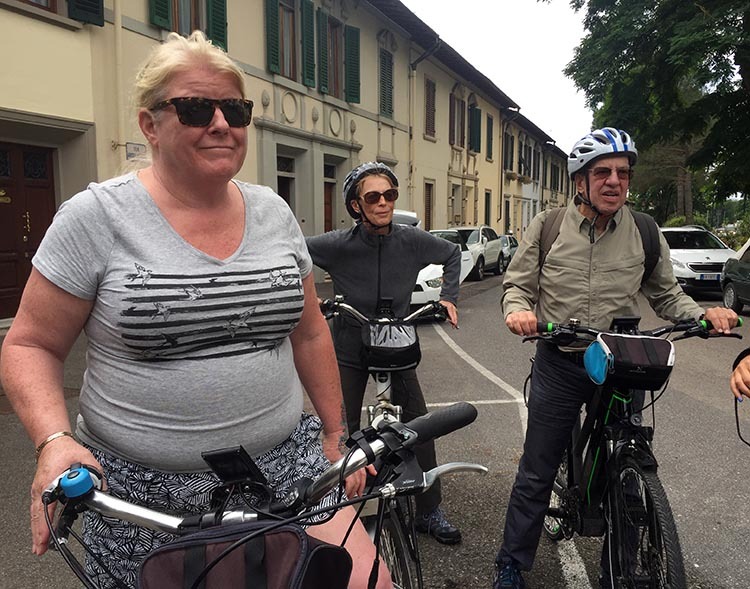 As with our ebike tour of Paris, France, our Electric Bike Tour of Florence turned out to be the highlight of our trip. Electric bike tours are an excellent way to see a city, especially when you have only limited time. 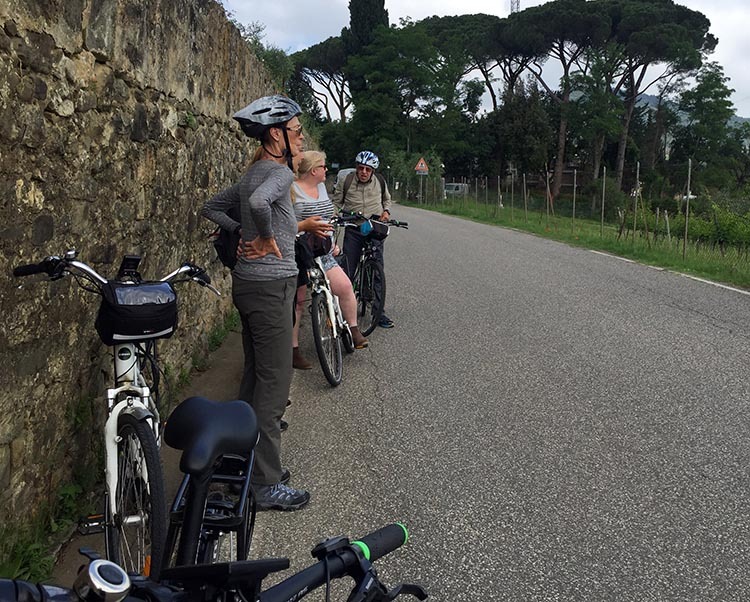 We were only in Florence for two days, so an ebike tour was ideal. We were able to cover a lot of ground without getting exhausted. And as usual on these ebike tours, we got to learn about the city from an expert. 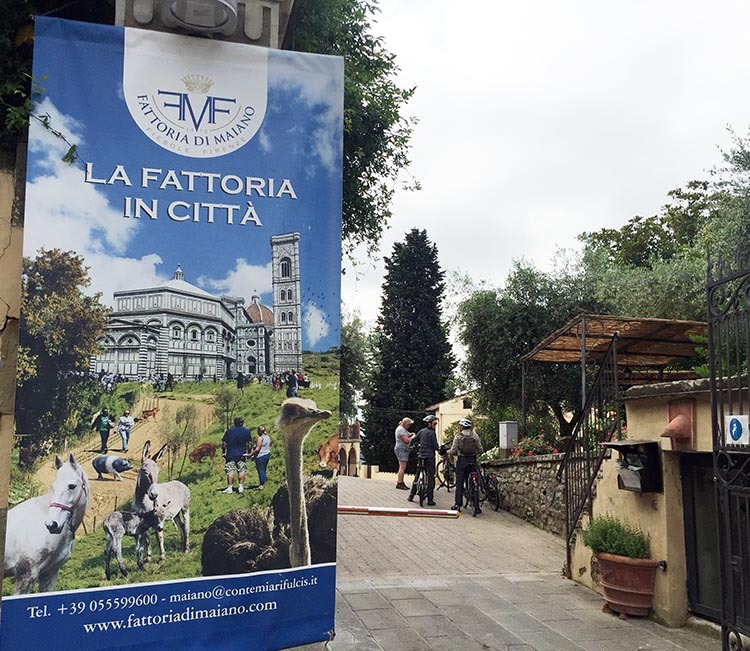 We booked this ebike tour through Viator, where it is billed as the Florence Electric Bike Tour with Farm and Wine Bar Visit. 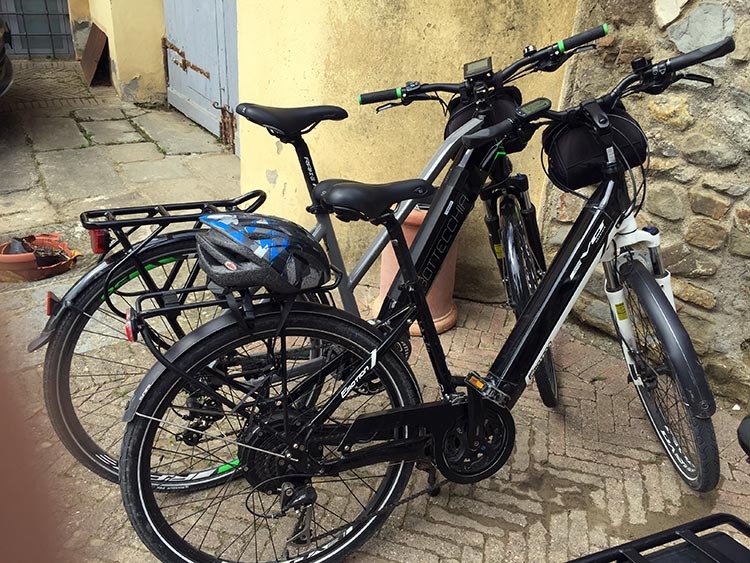 They had us at “Electric Bike Tour” – but the “Wine Bar Visit” definitely helped too! And we were encouraged by the 5 star rating on Trip Advisor. This short video gives an idea of what the ebike tour was like – although really, it is impossible to do it justice with just a video. You have to do it yourself to appreciate the full experience! 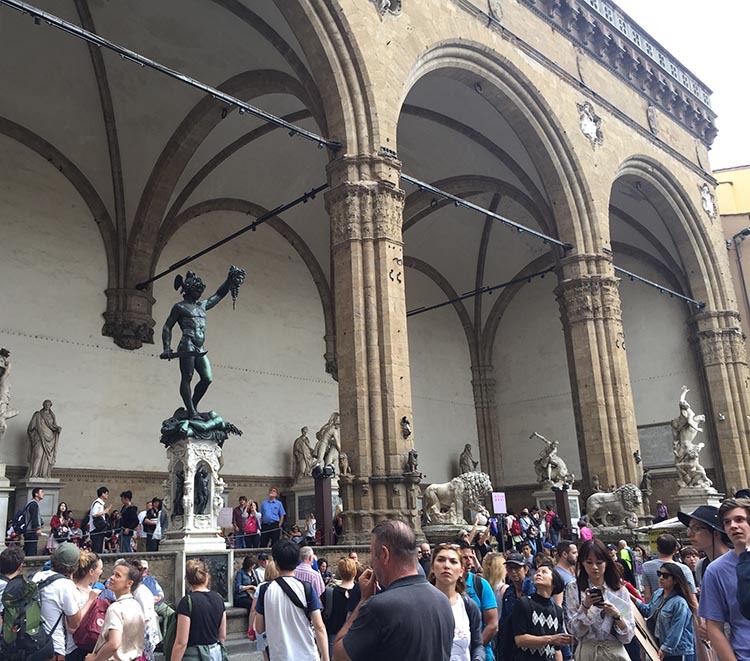 We knew from our confirmation email that we needed to meet our group at a tiny restaurant called Trattoria da Benvenuto, in the heart of Florence’s historic district, a few steps from the tourist magnet of the Uffizi Gallery. On the other hand, we have never seen so many tourists in one place. This was a THRONG of people, interspersed with people on bikes, and even motor vehicles and horse-drawn carriages crawling along the cobble stones, through the masses. It exhausted us to the point where we happily paid eight euros for two tiny cappuccinos, just for the relief of being able to sit down for a few minutes. From that discovery, we figured out a game plan to be at the meeting spot by 8.50 the next morning. 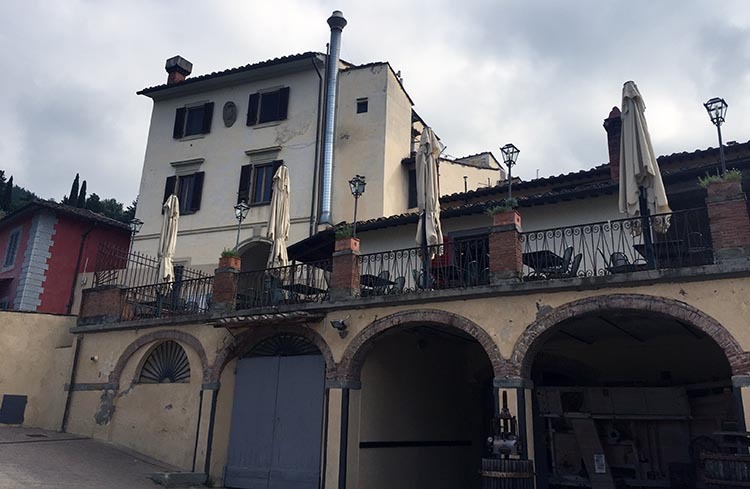 The next morning, we took a cab to Museo Galileo (Piazza de’ Giudici 1), which is right by the Arnot River, and then walked a few hundred feet to the meeting spot outside the Trattoria da Benvenuto. 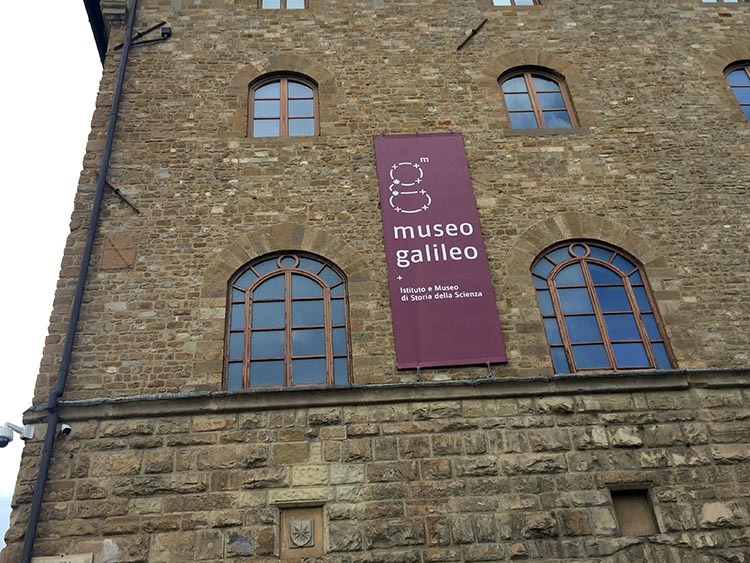 The Museo Galileo is very close to the meeting spot for the Florence Electric Bike Tour. It’s a museum dedicated to the history of science, and very well worth a visit, if you still have energy after your bike ride! If you happen to use this route to get there, note that there is a coffee shop across the lane from the Museo Galileo, which is frequented by numerous local workers, notably police officers. You can sit down in comfort, and the prices are much lower than the cafes just a few hundred feet away, in the heart of tourist central. We paid six euros for two cappuccinos and two croissants (“due cappuchini e due cornetti!”), which was a great price in that area. 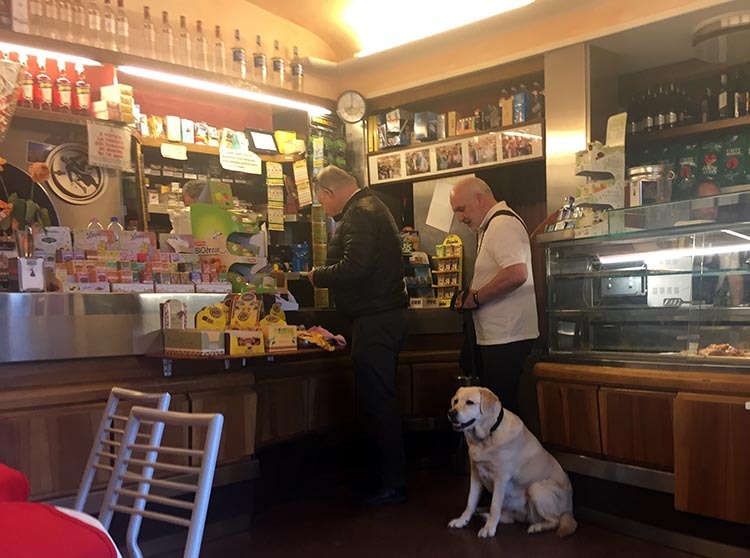 We were amused to watch a man getting his breakfast with his Labrador in tow – under the heading of things you never see in nanny states. Every time he turned his back, someone would throw the dog a morsel of pastry – a great morning for that dog! Under the heading of things you never see in nanny states – we were amused to watch a man getting his breakfast with his Labrador in tow! Fortified by our tiny breakfast, we set off again to the Trattoria da Benvenuto. 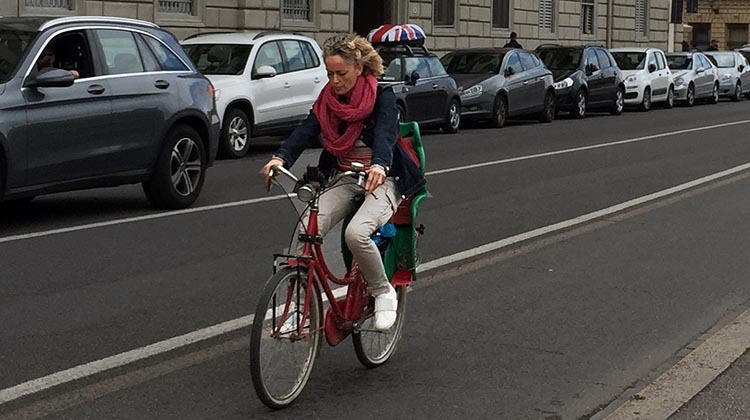 There we immediately spotted a couple who looked like adventurous spirits about to ride bikes in Florence. Sure enough, they turned out to be George Levy and Sharon Myers from Michigan. They are world travelers, and you can see some of George’s beautiful photographs on his website, George Levy Photography. Not only were George and Sharon fun fellow-cyclists, but they also turned out to be the only other people on the tour. This was a great bonus, making the ebike tour close to a private tour. We were told that the tours go on as long as there is a minimum of two participants. When we did our electric bike tour of Paris (which you can read about here), we were in a group of about 14 people in their twenties – plus us, definitely not in our twenties. It was a lot more fun being in a small group, with people our own age. Not that we were unable to keep up with the 20-year-olds – that’s the joy of ebikes! Promptly at 8.50 a.m. our tour guide showed up – a young woman named Alessia Fasulo. Contrary to what it said on our booking confirmation, we required neither a voucher nor a picture ID. Alessia was expecting us! 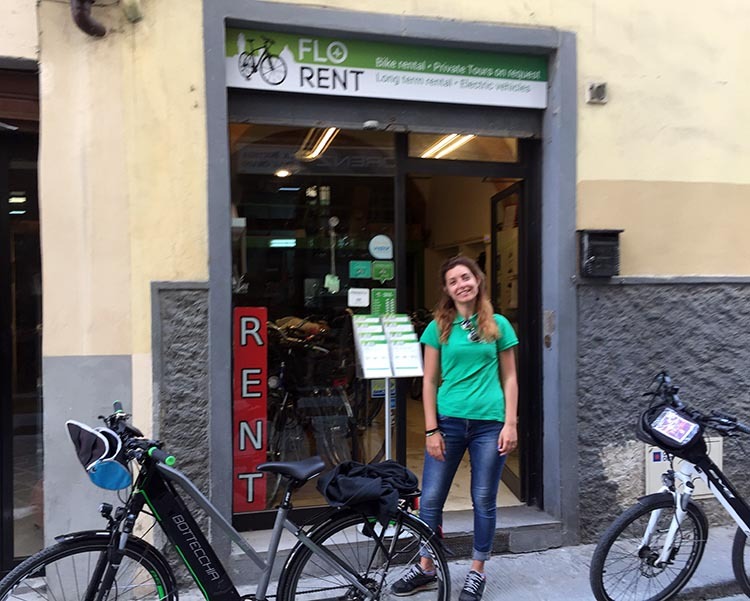 Alessia took us to the Flo Rent Bike rental shop, which is just two doors down from the Trattoria da Benvenuto, at Via Della Mosca 10R. Turns out that Alessia and her fiancé, Gabriele Quarta, co-own the bike rental shop. 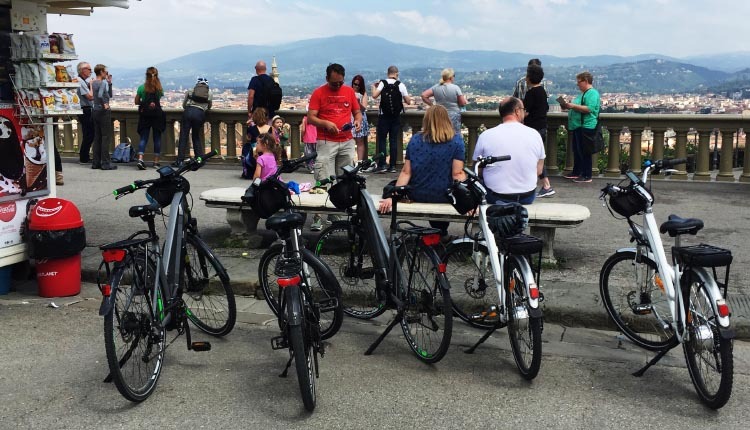 In 2012, they started offering the very first electric bike tours in Florence. Since then, a few other companies have followed their successful example. 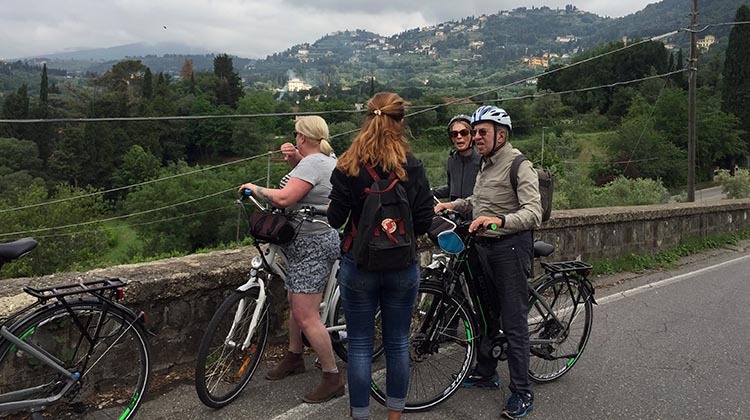 Offering the bike tours on electric bikes enables Alessia to take tourists up the hills that surround Florence, gaining access to magnificent views that cannot be accessed on walking tours, or on regular bike tours (the hills are too steep for anyone but elite athletes to tackle on regular bikes). Alessia was a charming and informative tour guide, who spoke excellent English. As is usual in Europe, there are pretty much no rules. You can choose to wear a helmet or not, and no one even mentions wearing reflective vests or signing 3-page waivers. I chose to wear a helmet to protect my head from the sun (as my hair is no longer thick enough to do that job). Maggie enjoyed the freedom of the wind in her hair. 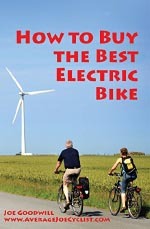 There were a variety of electric bikes to use, and I was pleased to get an Evolution electric bike with good shocks. We took some time to get our bikes just right, including adjusting saddle height and trying them out. At that time of the morning, the lane was cool and there were only a few tourists, so it was easy to ride up and down and get our bikes sorted out. To my relief, we were able to leave my heavy backpack at the bike shop during our tour. “If you ride your bike in Italy, Spain, France, Belgium, Holland, most of Scandinavia, people don’t look at you like you’re in their way. They don’t see you as the enemy.” (Source: Why Isn’t it a Crime to Kill a Cyclist with a Car?). It could also be due to the fact that Italy has a Road Murder law, which states that collisions that cause death or serious injury must be treated as an indictable offense, and makes convicted drivers subject to tougher sentencing, such as 12 years in prison for drivers found guilty of killing while under the influence of alcohol or drugs. (Source: European Transport Safety Council). 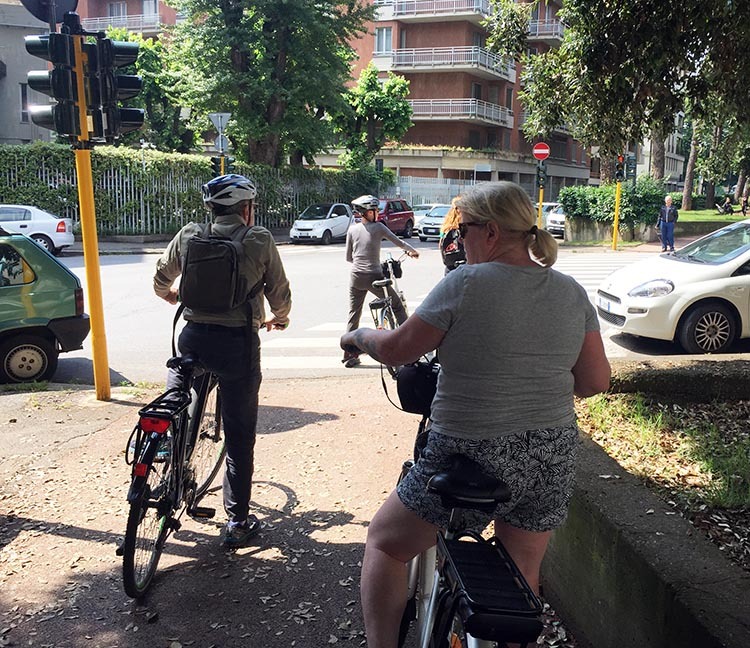 Whatever the reason, we found Italian drivers to be careful and respectful of cyclists, so we never felt afraid. Soon we got to a part of the city where there is quite impressive cycling infrastructure, with totally separate bike lanes, and even some bike-specific traffic lights. Alessia explained that when they designed the route, they tried to choose separate bike lanes whenever possible, to keep tourists out of the way of traffic. 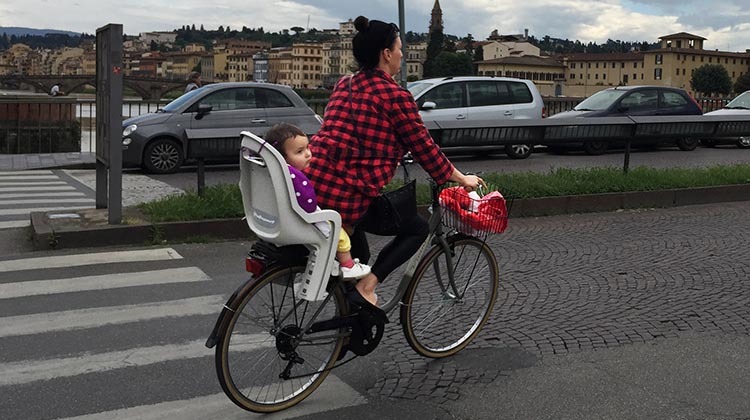 It made sense to us that there was good cycling infrastructure, as we had noticed the day before that there are huge numbers of people on bikes in Florence. 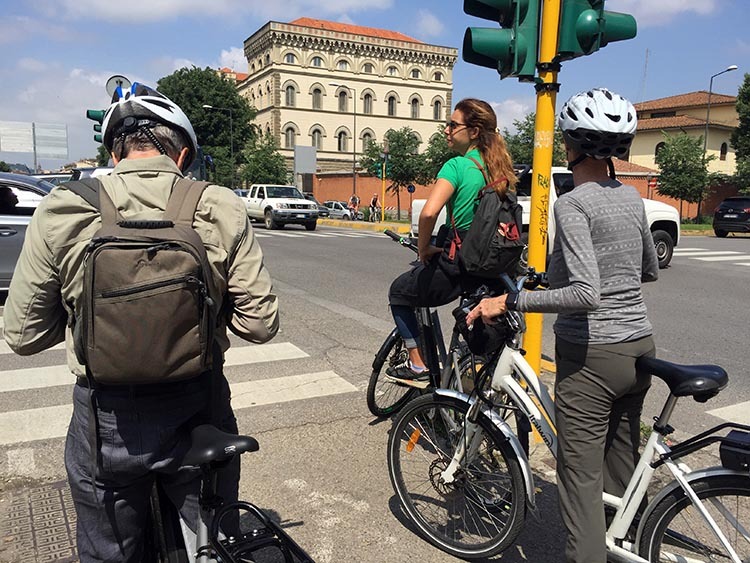 Unlike in North America, most of them look like they were on their way to lunch at a stylish restaurant, when they just happened to change their minds and jump on a bike instead. No Lycra, no helmets, no high-viz vests! Another encouraging sign was the fact that many of the bikes were equipped with child seats, and we saw many parents transporting their children on bikes. We had also noticed Mobikes all over the city. These are dockless bike share bikes, activated with bar codes on your smart phone. They can be found all over the city of Florence. Most of the bike ride was relaxing, but it did require sufficient cycling skills to take tight corners, maintain balance at low speeds, and maneuver through pedestrians, as well as the ability to remain calm while cars passed you by at fairly close proximity. If you are still learning to ride a bike, this is not the tour for you. Also, if you have never ridden an electric bike, start off with a low level of assistance – otherwise, the speed with which you pull off may startle you. All of the ebikes used were pedelecs, which means that the motor does not start working until you start pedaling – and stops working immediately when you brake. This is the best of all worlds in my opinion, as you get some exercise, but you also get help for the hills. Plus, the instant cut-off of power when you brake is an essential safety feature. Like us, George and Sharon also own ebikes back home, and agree that electric bikes are wonderful because they are so much fun, and cause you to do much more cycling that you would do if you didn’t have that extra bit of help! We soon left the Florence city center and entered the suburb of Fiesole. Alessia gave us a one-minute lesson on how to cycle uphill on an ebike. The key: do NOT stop, as pulling off again is hard. We did a sustained uphill ride, which was really easy, as the bikes have ample motor power, battery, and gears. All were required to get up that hill. Maggie and I both used an easy gear and maximum power. At the top of the hill we got to La Fattoria in Citta (the factory in the city), which is basically an organic olive farm with spectacular views. We left the bikes just parked in the car park, apparently completely safe (as almost no one else makes it to the top of that hill, I guess!). Parts of the 1996 movie, A Room with a View, were filmed on this property and in its villa. The impressive villa at La Fattoria in Citta. Parts of the 1996 movie, A Room with a View, were filmed in this villa. 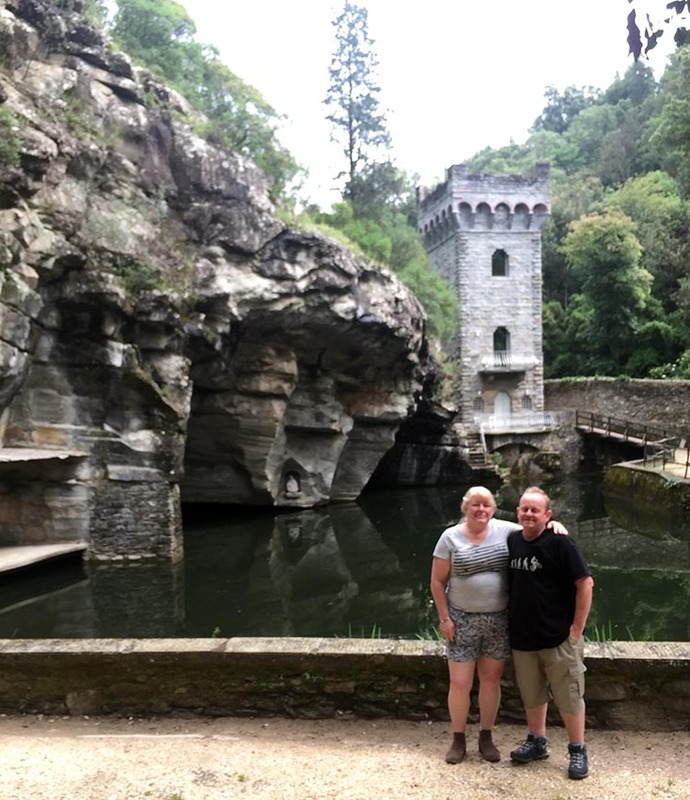 Another one of La Fattoria in Citta’s claims to fame is the Laghetto delle Colonne, which boasts a miniature castle turret over a pond in a quarry. The tiny castle was built to accommodate Queen Victoria when she visited Florence in 1929. It’s now a bed and breakfast; so if you are looking for a really unusual honeymoon suite, look no further! Here are Maggie and I standing outside it (no, we never went inside, sadly). The other buildings on the site are equally spectacular. 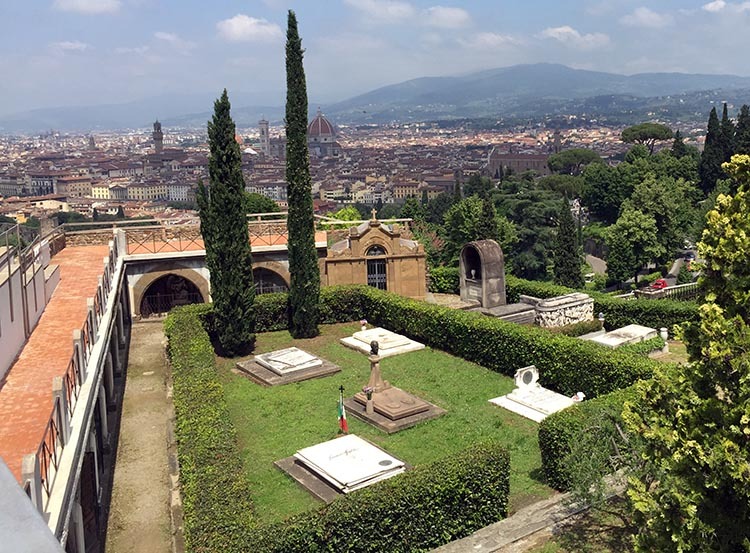 We took a relaxed walk around the botanical gardens and enjoyed a spectacular view of Florence, plus close proximity to an impressive mixture of poultry, and even a couple of wild boar piglets (which made me feel extremely guilty about having ordered wild boar the day before). On the way up and down the Fiesole hill, we stopped a few times to admire the view and take some photos. On the way up and down the Fiesole hill above Florence, we stopped a few times to admire the view and take some photos. 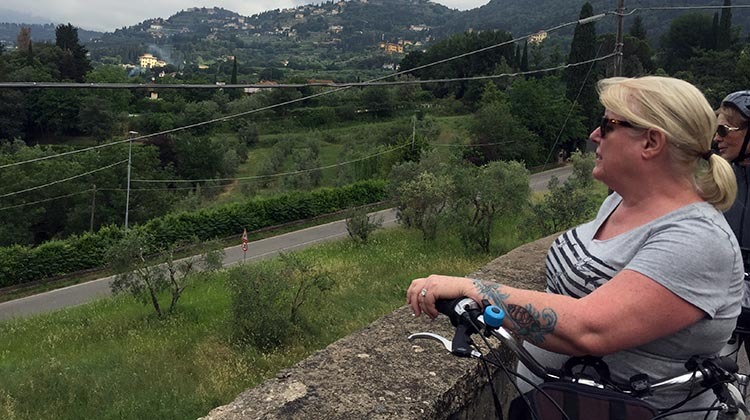 Next we descended the Fiesole hill and crossed the wide and muddy Arno River (on a bridge! 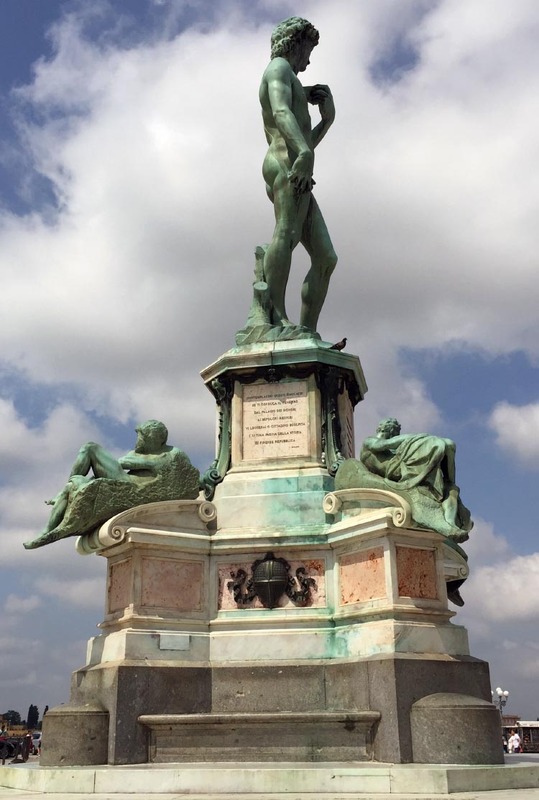 ), to make the ascent up another hill to the one-of-a-kind Piazza Michelangelo. 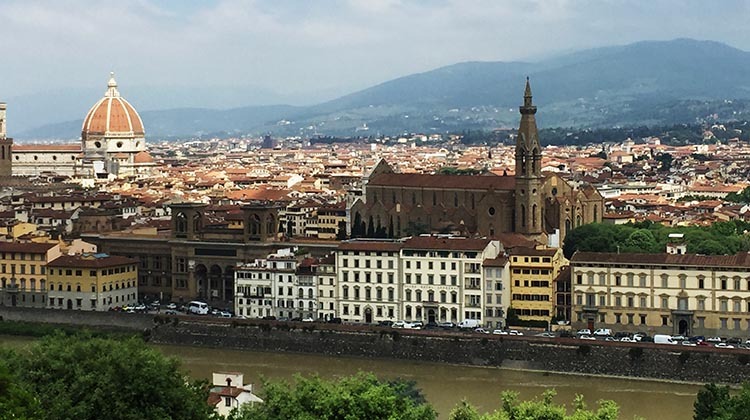 It’s basically a huge open area offering the best possible view of the whole of Florence. 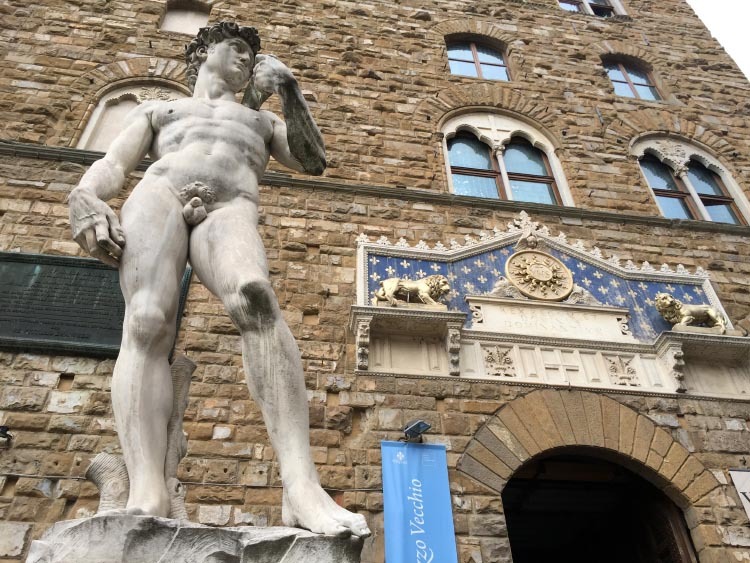 In the center of the Piazza is another giant replica of Michelangelo’s David, flanked by other statues, in an impressive homage to Michelangelo. Also in the square are many booths where you can buy ice cream and souvenirs. The ice creams were somewhat life saving at that point on a sunny morning, after three hours of cycling and walking. And Maggie was thrilled to buy a beautiful, soft cashmere shawl for ten euros. I got a tasteful blue baseball cap emblazoned with the word “Italia” in bright red! Subtle. Alessia then told us that we were still not quite at the highest point, so we were going to bike even further uphill! 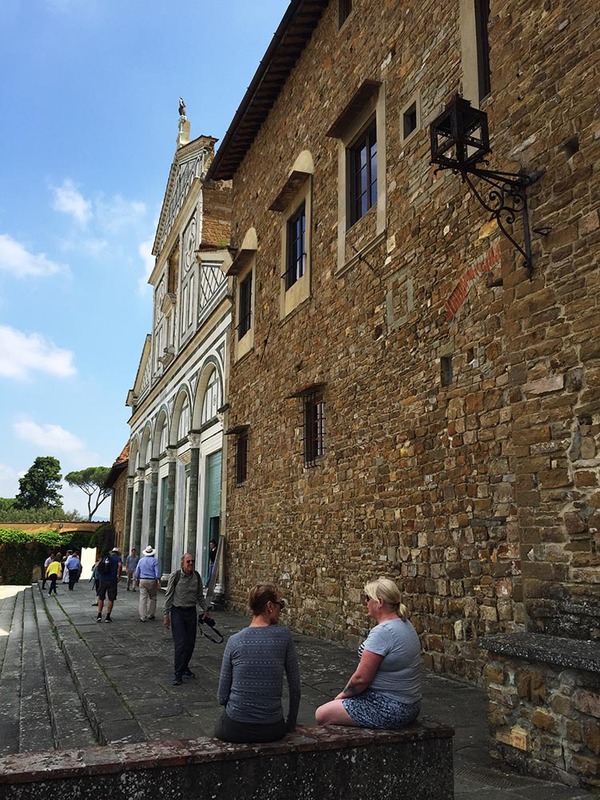 She led us up a lane to San Miniato al Monte, an ancient church built on the very highest point above Florence. When we were there, it was celebrating its one thousand year anniversary! The views were again spectacular, and we were able to go into the church and view a stunning variety of religious art. The church is still a working monastery. Next we enjoyed an exhilarating (and sometimes slightly scary) ride down the hill, through the traffic and narrow alleys, and back to the bike shop. 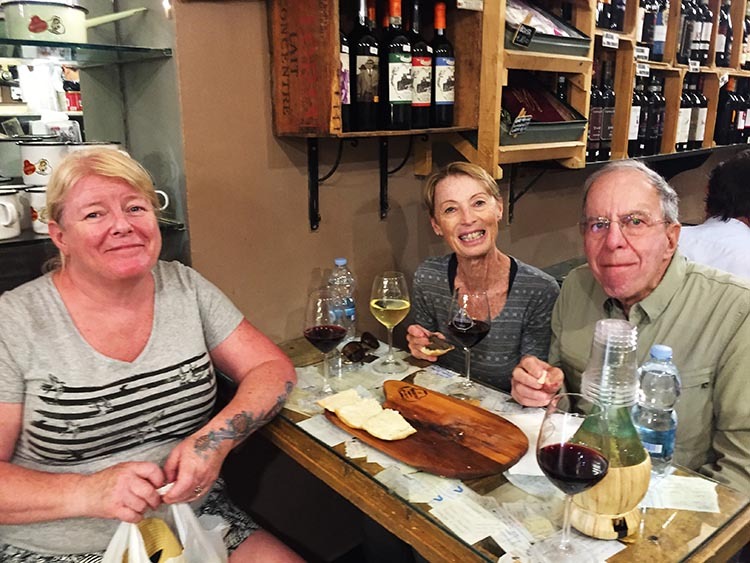 An assistant relieved us of our bikes and gave us back our baggage, and Alessia took us to a very nearby wine bar, where we enjoyed complimentary wine and snacks with George and Sharon. Maggie enjoying complimentary wine and snacks with Sharon and George. Well deserved after four hours cycling in the sun! Unfortunately we were in a hurry to catch a train, but if we had had the time, we might have spent some of our own money on the quite amazing food available at the wine bar, such as truly incredible plates of antipasti. 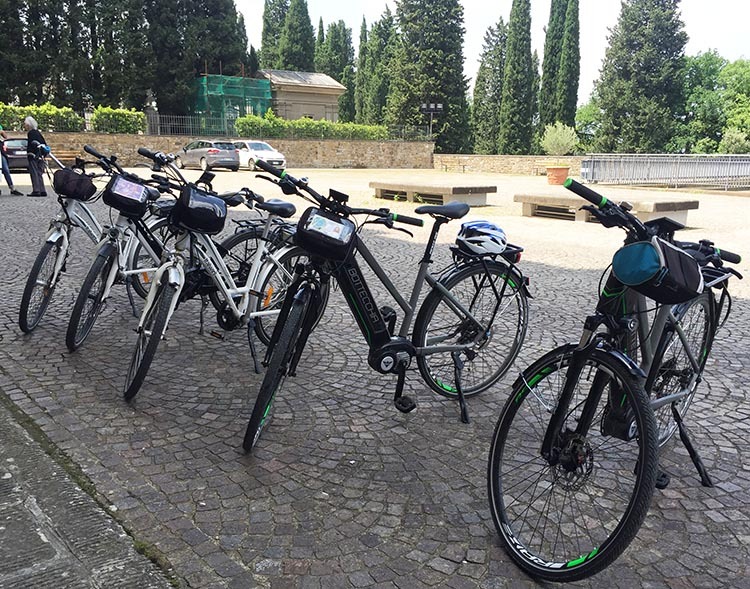 Find out more about the Electric Bike Tour of Florence here!